Welcome to the Shady Pine located in the private community of Connestee Falls. 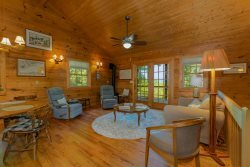 Shady Pine is set in a rural ambience that gives the home a feel of privacy. This three-level home includes a full-size pool table, a gas fire place and lots of space to relax and enjoy in! The deck is great for grilling and enjoying the cool summer air. This home is ideal for family gatherings. Because this home is in Connestee Falls, you will enjoy excellent amenities, including 13+ miles of private hiking trails and a George Cobb Designed Golf Course. Everyone we came in contact was so kind and helpful. Absolutely Fabulous!!! Didn't want to leave.